A new and special manner to present original content to a captive and devoted audience has been created by The New York Anime Festival (NYAF) who today announced that the short story Vampire Hunter D: The Wanderer's Ship by Hideyuki Kikuchi will be published inside its Official Guide Book. Vampire Hunter D: The Wanderer's Ship has never been printed before in any language anywhere in the world. The New York Anime Festival, an anime, manga, and Japanese pop culture convention from the creators of New York Comic Con, takes place September 26th through the 28th at the Jacob Javits Center in New York, NY. Hideyuki Kikuchi is one of Japan's most prolific horror novelists and one of the New York Anime Festival's Guests of Honor. Mr. Kikuchi is most famous for his Vampire Hunter D novel series, stories that follow "D" -- a half-human, half-vampire swordsman -- through a dystopic future ruled by vampires. The first D novel, penned in Japan in 1983, has been followed by over 15 sequels, with the most recent -- Throng of Heretics -- released in Japan in 2007. Mr. Kikichi is attending NYAF along with Vampire Hunter D illustrator Yoshitaka Amano and translator Kevin Leahy. 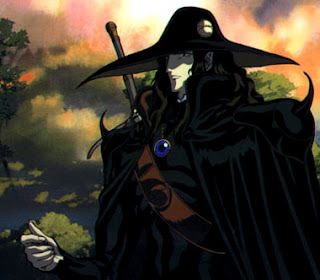 Vampire Hunter D: The Wanderer's Ship, a story of D and his encounter with a blood-red battleship, dates back to one of the author's "Talk Live" events. Each year, Mr. Kikichi hosts several "Talk Live" gathering in the Kabukicho section of Shinjuku. At these events, he introduces a younger generation of fans to a wide variety of horror and sci-fi films and brings them face-to-face with guests from the worlds of publishing, animation, and film. The events conclude with drawings that give the audience chances to win signed books, artwork, and other exclusive prizes. The very best is saved for last -- short stories handwritten by Mr. Kikuchi with exclusive publication rights. "It is with great pleasure that the New York Anime Festival presents Vampire Hunter D: The Wanderer's Ship in print for the first time anywhere, in any language," NYAF Show Manager Lance Fensterman said. "This is a genuinely historic moment, something for Kikuchi's fans around the globe, and it is only possible because of the generosity of Ms. Hitomi Yasue and the hard work of Mr. Kevin Leahy." The New York Anime Festival Guide Book will be available in the Jacob Javits Center lobby from September 26-28, 2008. Tickets to the New York Anime Festival are now available at newyorkanimefestival.com. The New York Anime Festival takes place September 26-28, 2008 at the Jacob K. Javits Center in Midtown Manhattan and is organized by Reed Exhibitions, the creators of New York Comic Con. The New York Anime Festival showcases the best of anime pop culture, including the latest anime, manga, Japanese cinema, music, and games, and anime-influenced comics, animation, and films from around the world. The festival features exclusive and extensive screenings, a gala cosplay masquerade, sessions with the some of the biggest names in anime from Japan, Asia, and America, and explores the Japanese cultural experience with displays of both traditional and cutting-edge Japanese life. NYAF's partners include Anime News Network, Bandai Entertainment, BookExpo America, Del Rey Manga, DigitalLife, Free Arts NYC, Japan Society, Karaterice, Kinokuniya Bookstore, New York Comic Con, Samurai Beat Radio, Subway Cinema, TheOtaku.com, TOKYOPOP, VIZ Pictures, and the World Cosplay Summit. Further information can be found at newyorkanimefestival.com. The New York Anime Festival is operated by Reed Exhibitions, the world's leading events organizer. In 2007, Reed brought together over six million industry professionals from around the world generating billions of dollars in business. Today, Reed events are held in 38 countries throughout the Americas, Europe, the Middle East, and Asia and organized by 39 fully staffed offices. Reed Exhibitions is part of Reed Elsevier Group plc, a FTSE-100 company and world-leading publisher and information provider. In 2006, Reed Elsevier made adjusted profit before taxation of #1,052 million on turnover of #5,398 million.